Yes. I would buy thses again. I love, love, love these covers I use them every day. they keep items fresh when I store in the refrigerator. The product arrived quickly, but be sure to count the number of covers. There was supposed to be 24 but there was only 23. Miles Kimball is making it right with me and I like that. I love this product - sure beats fighting plastic wrap on the rolls. First, the good news: versatile, usable for various container sizes, and they work well to cover a bowl or mug or whatever you want covered to go in the fridge. The bad news: the insert says they can be used "up to 10 times." So that makes them disposable bowl covers if you have to throw them away after a few uses, and they don't last anywhere near 10 uses before the plastic cover starts tearing away from the elastic. They aren't durable for multiple uses at all. So while they do what they're supposed to do, they just don't hold up well for multiple use. I planned to use these bowl cover for left overs and on the go food. There is nothing great about these bowl covers. They are so cheap that the elastic pulls away from the cover before you can get them over your plate or bowl. The manufacturer claims you can wash them off up to ten times but I can't even wash them once. Thumbs down all the way. I love these. They're great and last a long time. The reusable plastic bowl covers are so much more convenient then using plastic wrap or foil to cover dishes , and they cover and stay on much better too. Great for when you have some leftovers but not enough for larger storage unit, so just cover bowl & refrigerate. 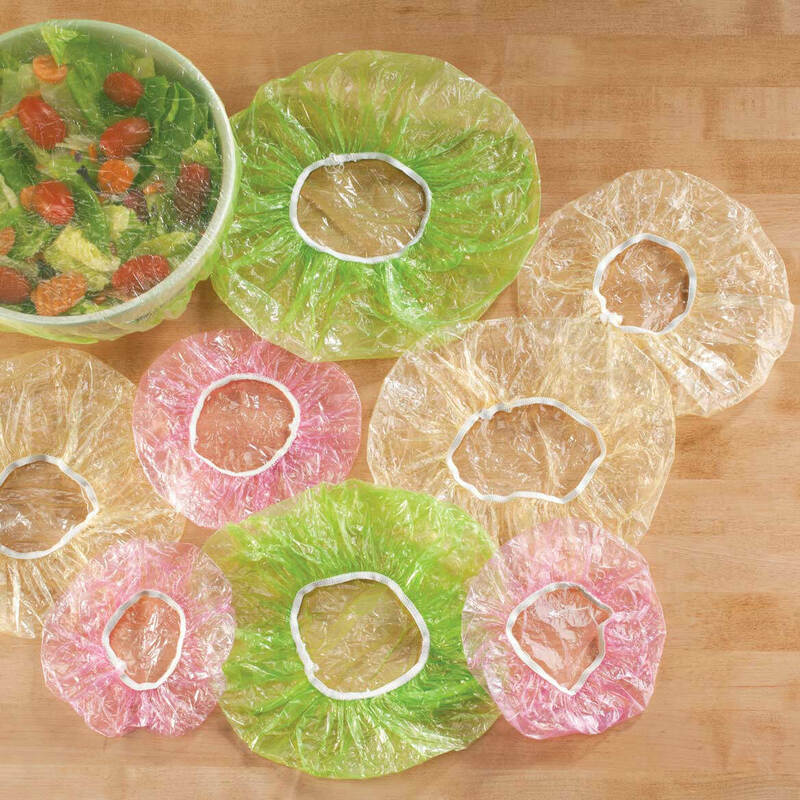 Great for covering salads & fruit dishes that need to be chilled before serving. I’ve been hunting for these very plastic bowl covers forever and my neighbor recommended I try you. I’m delighted to have found them, I look forward to receiving them. Because my grandma used them. I love these covers and the grocery stores do not carry this set size. Great covers for any shape of container. Tired of trying to get plastic wrap to stay put. I really like knowing what size I am grabbing when I have to cover a dish. The different colors lets you know in advance what size you are getting out of the drawer. For my daughter. She loves color so I picked these The colors will go good. My old ones finally needed to be replaced. The old ones came from Miles Kimball and lasted so well, I came back for more. Have had these before and they work well. I love them they keep food fresh. I couldn't find them in the stores. I like to use them for items that aren't going to be left over too long. I love these bowl covers. No more worrying about finding the right lid for the right bowl. I love the the easy uses. I have purchased the clear bowl covers and like these because they are different. I have used them before and I wanted to buy some new ones. I have used this item before. They are great. To cover all those bowls that don't have lids so I don't have to transfer leftovers into plastic lidded containers. It makes sense to eliminate the use of so much plastic wrap. need them and loved the cost. I use these constantly. They take up far less space when placing a dish in the refrigerator than trying to get the hard top lid in, and they make it easier to stack one on top of the other - another space saving reason to use them. very convenient for storing food in the fridge over my bowls. need to use them for. These lid covers are the best for covering food(s) whether for storage in refridg, cookout or on the stove. Love them. Retro. Takes me back to my Mom in the kitchen. Besides, they work great! Had some previously - held up well, great useful item. I've used these bowl covers before. They are great for the glass bowls that have no covers. to use for traveling with a fresh salad!